While I am a big fan of all things Yves Saint Laurent, I can't say I'm a fan of the Muse Two Satchel. Kim Kardashian (pictured above) with her black patent leather version of the Muse Two perfectly illustrates why design is of utmost importance when selecting a handbag. While the classic shape of the Muse Two is appealing, the unfortunate placement of the top handle was not properly thought out. The result is a slouchy, puckered look which was, I guarantee, not the intended effect. I expect much more from a $2000 bag. This might not seem important to most of you out there, but for sticklers for detail like me it's a major pet peeve. 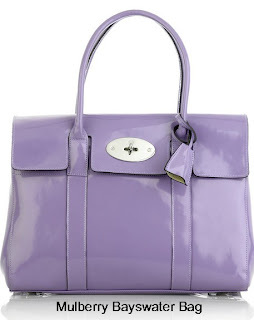 If you're interested in achieving the same look with well-placed handles and in a very flattering color to boot, be sure to look into the Mulberry Bayswater Bag. It's just as chic and a $1000 less than the Muse Two; there's some selling on eBay for around $500.